Pumpkin planters are a fun way to celebrate the season, and they’re quick and easy to make. Use them to dress patios and doorways. Add halloween lanterns and battery-operated fairy lights to the arrangement for extra atmosphere at dusk. A range of pumpkins large and small (buy from supermarkets, farmers’ markets and PYO farms). Pumpkin planters look great in groups or by themselves. 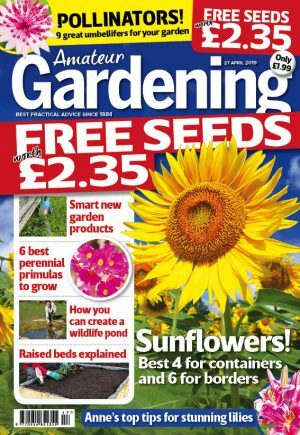 Any plants can be used, as long as they aren’t too big – there isn’t much room in a pumpkin so you’ll probably have to do a fair bit of cramming. We’ve gone for ‘halloween’ colours – red and purple chrysanths and asters, Japanese blood grass, purple and orange pansies, black mondo grass and trailing ivy. Carefully slice off the top with a kitchen knife and scoop out the flesh inside with an icecream scoop or sturdy spoon. To make the planters last longer, line them with a small piece of plastic (such as from an old compost bag). Pack in the plants, aiming to plant a tall variety in the centre with several smaller ones surrounding. Top up with compost, pushing down to fill any gaps. Water lightly and position in place. 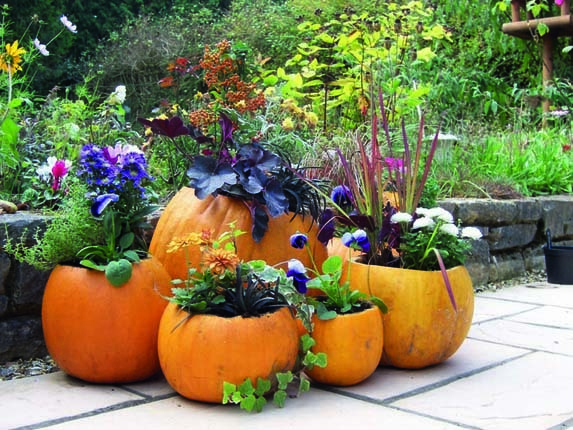 AFTERCARE: Being perishable, your pumpkin planters will only last a couple of weeks at best. Consign them to the compost heap and pot the plants into normal patio containers or the garden borders.